Set in the urban environment of central London, Wrapper joins a diverse landscape of buildings, with a mixture of scales, functions and architectural designs. 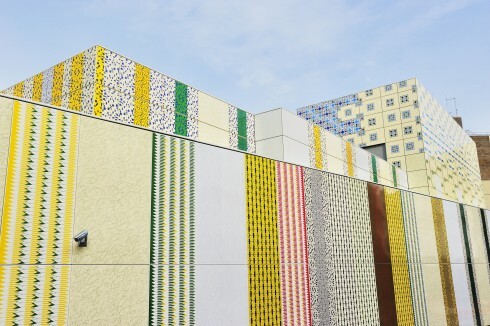 It stands out as a bright and colourful object whilst simultaneously blending in as a new addition to an area already full of constructions of all kinds and ages, from office blocks and houses to shops and schools. A work on this scale could have dominated the area, but Poncelet’s mix of patterns brings a kind of fragmentation to the building that helps to integrate it with its neighbours. In the busy environment of the Edgware Road area, the design also reflects the way in which the building will be viewed: more often in parts than as a whole. Depending on where the viewer stands in relation to the artwork, Wrapper reveals a variety of stories. 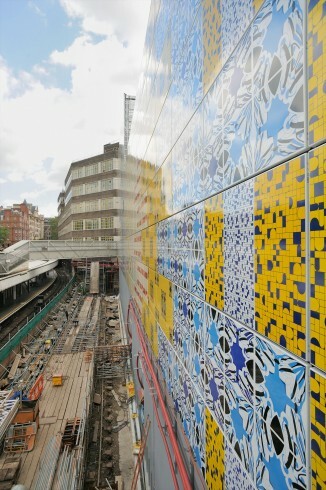 From the platform, for example, the fringe of the station’s roof can be recognised in the zig-zag pattern integrated into the work. On the other side of the building, local residents who can view it from their windows, or the people who pass by on foot, will see many more elements from the local area: the detailed tracings of leaves reference the trees in Regents Park, while the delicate water pattern suggests the Tyburn stream that runs underground nearby. 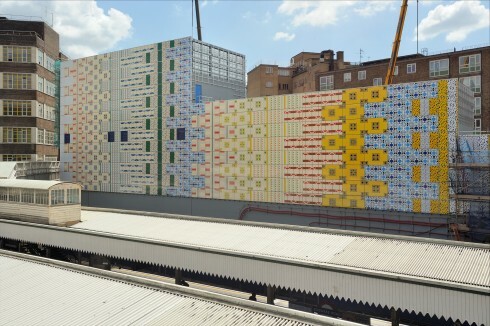 Seen from a distance or as a fleeting glimpse from a vehicle on Marylebone Road, Poncelet’s patterns, some of which she made from a drawing of cars, will look quite different again. 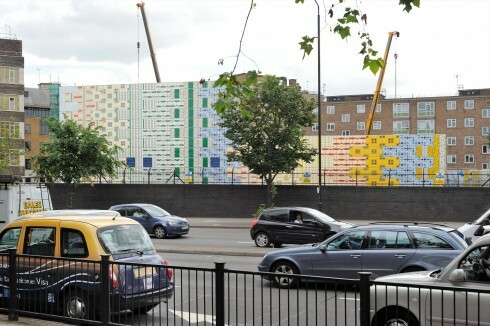 The colours all reflect those of the Tube map, hinting at the building’s connection to it. In Wrapper, and throughout Poncelet’s artistic practice, patterns and colours play a key role as storytellers. She uses them in carefully considered configurations and each has a very particular place and purpose in the overall composition. Through this visual choreography, the artist aims to generate illusionary spaces or simply to modulate stillness and movement. “A pattern not only speaks of other places, but of changes in our culture and the passage of time”, says Poncelet. With the patterns devised for Wrapper, she has replicated how we choose what we see in a complex and busy environment. By condensing her experience of the area and her understanding of the site through these motifs, she highlights the pleasures large and small that a place can awaken in us. This is the largest work created by Poncelet to date; indeed, it is the largest vitreous enamel artwork in Europe. Alongside the installation Wrapper, Art on the Underground has commissioned artist Jessie Brennan to work with station staff and local community groups including the St Marylebone Society, residents at 60 Penfold Street and students from City of Westminster College to develop a new drawing titled Everything Meets Here that parallels some of the research methods employed by Poncelet in her work. Nice to see something really different/risk averse and dare i say inspiring! This is a beautiful and uplifting work that brightens up my day when I walk past it. 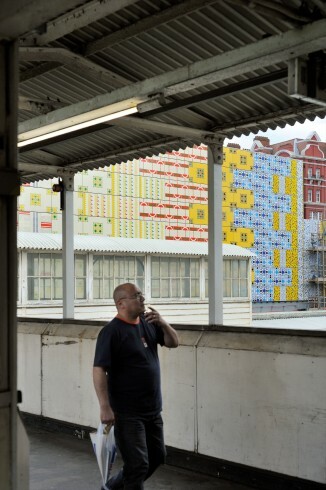 Wrapper by Jacqueline Poncelet is a monumentally wonderful addition to the landscape of the Edgware Road. I see it everyday and for me it has become a shinning beacon of positivity that I associate with the area. I am pleased it is here to stay! Was very exciting to see this work unfold and emerge on the side of the new station. The pattern kept spreading and changing as I walked past on the way to work and back. I especially like the different scale of the patterns, from over this side of the Marylebone Road it’s very bold and really lifts an otherwise quite uninspiring vista and on the more residential side of the station is much more a tapestry. This is a complete eyesore. I thought it was an unfortunate base layer before the real cladding went on, but it seems to have remained and appears to be intentional. Please, can we fix it?